Homemade German Egg Liqueur (Eierlikör) is a rich, sweet, and decadent beverage. It can also be used in baking or drizzling on cakes. Cut vanilla bean lengthwise and scrape out the seeds. Discard outer bean. Place egg yolks, vanilla seeds, and sugar in the bowl of a stand mixer fitted with the whisk beater. Beat on high speed for 10 minutes. Slowly add cream and condensed milk and beat for 7 minutes. Slowly add rum and beat for 3 minutes. 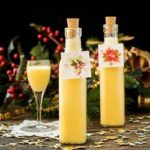 Pour egg liqueur in decorative bottles or containers. Seal and refrigerate for up to 3 weeks.